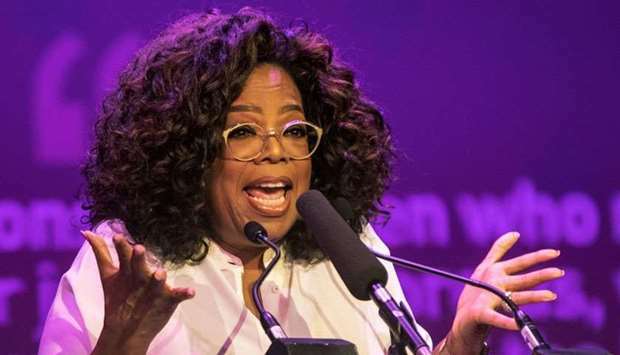 Celebrity talk show host Oprah Winfrey waded into the Michael Jackson debate Monday, hosting an hour-long interview of the men who say the late superstar sexually abused them as minors. The special aired on HBO after the conclusion of the network's presentation of a bombshell four-hour documentary entitled "Leaving Neverland," which has thrown the late Jackson's legacy into question nearly a decade after his death. Calling sexual abuse "a scourge on humanity," Winfrey said "this moment transcends Michael Jackson. It's much bigger than any one person." Winfrey -- channeling her decades of experience as one of America's foremost talkshow hosts -- unpacked how Jackson's accusers began to identify themselves as victims, and why they remained silent for so long. "He told me it was love," said Wade Robson, now 36. "He told me that he loved me and that God brought us together. Michael was God to me." Robson said he had testified in 2005 on behalf of Jackson, who was ultimately acquitted of those sexual abuse charges, because "if I was to question Michael and my story with my Michael, it would mean I would have to question everything in my life." James Safechuck, 41, told Winfrey how Jackson "would cry for you, or he would cry because he's so lonely. You want to be there for him." But fatherhood and seeking help encouraged them to speak candidly about their experiences, they said. It's not the first public airing of abuse claims against the pop star but the release marks the scandal's first major explosion since his fatal overdose at age 50 in 2009. In the special dubbed "After Neverland" Winfrey referenced her own history as a survivor of childhood sexual abuse -- but did not mention the famous interview she held with Jackson at his Neverland ranch in 1993, which occurred just before the first public accusations dropped against him. The Jackson estate -- which is suing HBO for $100 million over a "posthumous character assassination" -- has vehemently denied all allegations agains the late King of Pop, and attacked the credibility of both the documentary and his accusers. "Since my uncle is not around to defend himself, the credibility of accusers matter. And Wade and James have none," tweeted Jackson's nephew Taj following the airing of the documentary's first half. Jackson diehards have swarmed Twitter under the hashtags #MJInnocent and #LeavingNeverland to defend their idol, who died at age 50 in 2009 of a drug overdose. But director Dan Reed has voiced hope that the film could "inspire other victims to break their silence" and "not feel quite so ashamed." "Certainly Michael had many more victims," Reed told AFP. "They are going to come forward when the time is right for them."